In a large sauce pan add olive oil and chopped chicken, cook through. Season chicken while cooking with garlic powder, salt and pepper. When chicken is cooked through add bbq sauce, molasses and stir to coat, cooking on medium. When chicken and sauce appears sticky add water, reduce heat to low and simmer 10 minutes, when done remove from heat and let cool before adding to the salad. Add lettuce, cabbage, onion, and goat cheese to a large salad bowl and toss well. 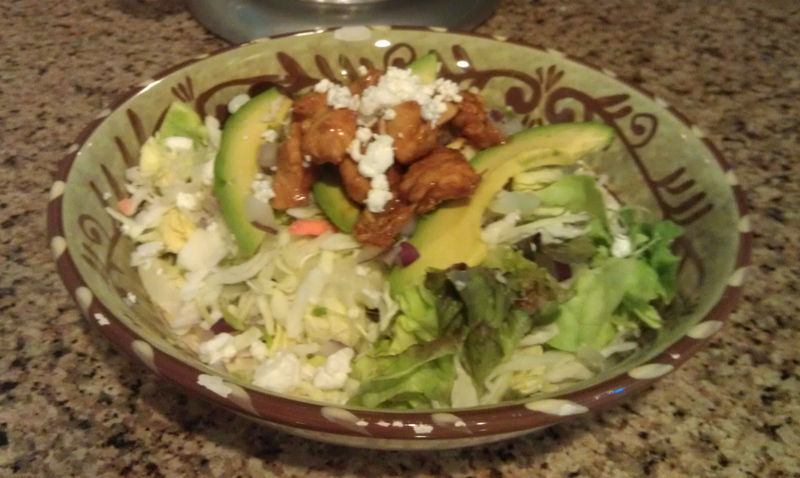 In serving bowl add lettuce mix, avocado, chicken, and toss with homemade ranch dressing.